My grandmother grew rhubarb in her lush New Jersey garden, those sturdy shoots were the first to appear with the delicate chives. Her rhubarb cobbler wore a dense, butter-rich crumb crust and she stewed it into tangy sauce for plain vanilla ice cream. What's more, she made a terrific rhubarb lemonade and a wonderful glaze for chicken. 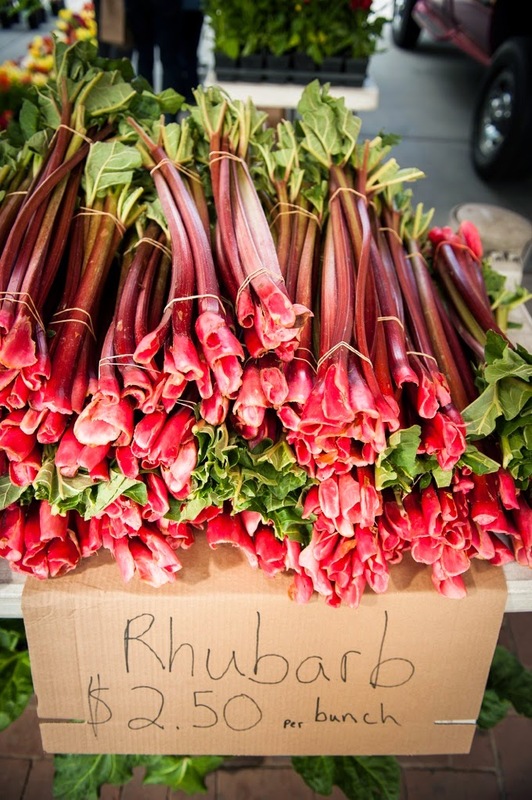 I learned there's more to rhubarb than dessert. As those valiant stalks appear in my garden and are piled on farmers market stalls, I become that happy kid, joyfully snipping fat stalks to turn into something deliciously pink. Put all of the ingredients into a medium pot and simmer until the rhubarb is just soft. Add a little of the sugar and then add more to taste. It shouldn't be too sweet! Put the rhubarb into a glass pitcher and cover with about 1 quart of water. Allow to steep overnight. Strain off the rhubarb. Sweeten with the sugar or honey to taste. Serve over ice with fresh mint for garnish and a splash of vodka (if you like). Ooh, Beth. This looks SO good. I'm off to the store shortly and you've certainly inspired my shopping list!